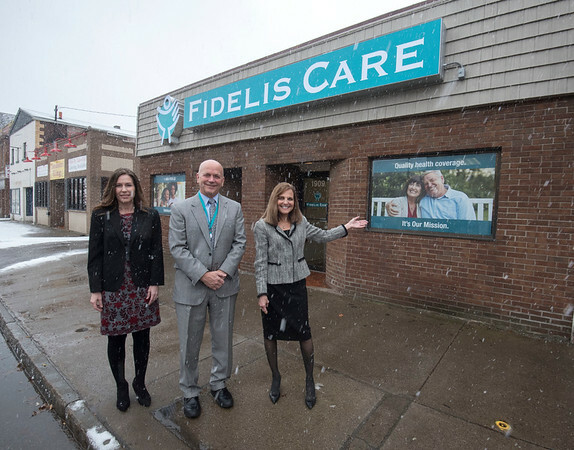 Niagara Falls, NY - Fidelis Care officials, Jennifer Lyons, director of marketing and sales, Scott Averill, vice president of sales and marketing and Pam Hassen, chief member engagement officer celebrate the official opening of the new Pine Avenue business. Niagara Falls, NY (December 6, 2018) – Fidelis Care celebrated the opening of its new Niagara Falls Community Office today with a ribbon cutting ceremony attended by local dignitaries, providers, and community organizations. Located at 1909 Pine Avenue, the new office provides a convenient location for local residents shopping for health insurance to have their questions answered and receive help applying for enrollment. Open enrollment for Qualified Health Plans through NY State of Health is underway, and Fidelis Care offers the lowest monthly premiums for standard “metal-level” plans in Niagara County. Local residents must enroll by December 15 to have coverage for January 1, 2019, and by January 31 to be covered in 2019. Fidelis Care representatives can help local residents review their coverage options and choose the right plan based on their health care needs. Local residents who are members of Fidelis Care can stop by the new office for help renewing their coverage or updating their NY State of Health account. Fidelis Care serves more than 38,000 Niagara County residents and has more than 1.7 million members Statewide. The new Community Office is open Monday through Friday 8:30 AM to 5 PM with extended hours during open enrollment, every Wednesday from 5 PM to 7 PM.